The story of Japanese archaeologist Ryoichi and evidence of his worldwide excavations are explored by Patrick Nagatani in this series of photographs. Nagatani presents a narrative of Ryoichi’s archeological work, supported by images of excavation sites, unearthed artifacts, and Ryoichi’s own journal pages. 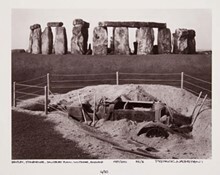 According to the photographs, Ryoichi discovered evidence of an automobile culture buried at sites across several continents: Stonehenge, the Grand Canyon, and a necropolis in China. This provocative and playful series compels viewers to reflect on how photographs and institutions, such as museums, shape our knowledge of the past and present.